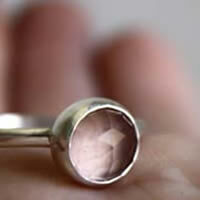 Pink quartz is a stone with a pale pink color that can go to a red pink. It can be transparent or translucent. The transparent one is quite rare and you will hardly find it under the shape of big crystals. For a long time, it was thought that it was dyed by iron oxides, manganese and titan but recent studies showed that its color comes from microscopic fibers of dumortierite. There is a rare variety of pink quartz that contains rutilated golden silt that gives reflections in the shape of 6 branch star once polished as a cabochon. Pink quartz crystals are fragile and break easily. You can often see fractures inside the stones. Its color seems to be photosensitive and would lose intensity in time. It is also called cristallus colorata rubra, ruby color rock crystal, hyaline pink quartz, milky quartz, rhodite, rosenrother quartz, Ancone ruby, boheme ruby or Silesia ruby. Pink quartz was linked very early to the heart and to love. In the Middle East cultures, from the bronze period to antiquity, pink quartz used to be offered to the fertility goddess Astarte who was also the goddess of love and war. During the reign of Egyptian pharaohs, it was thought that pink quartz could embellish the face and would slow down the old age. This is why it was used for beauty masks to correct the skin color and to eliminate wrinkles. Therefore, it would be a common present in the graves of noble Egyptians. The Romans believed the same thing too. According to the Greek legend, Aphrodite would have created the pink quartz. While her lover Adonis was hunting, he was attacked by a boar. According to different versions, this boar had been sent by the jealous and official lover of Aphrodite, who was Ares. Another story says Ares transformed himself into the boar. Aphrodite would have hurried in the thicket to save Adonis and got scratched in a bramble bush. She found Adonis almost dead. Their bloods would have mixed together and got transformed into a beautiful pink crystal. Another legend says that Eros put the pink quartz on Earth in the hope that its beauty would produce love and passion to humans, instead of wrath and hatred. Romans of the antiquity would mainly import the pink quartz from Sri Lanka and India mines. Today, we still can find some beautiful cut stones of this period, sometimes such as rings with a personal seal. Mines: Brazil, India, Madagascar, South Africa, Mexico, Poland and Russia. Pink quartz would stimulate the heart. It would strengthen the blood system as well as veins. It would help curing kidneys and adrenals. Pink quartz would help with vertigo problems. It would help with fertility. Due to its relaxing properties, it is often used for nervous diseases and for insomnia. Pink quartz would help with asthma problems, flu, intoxication and varices. It would be good for giving birth because it would calm down the baby by putting the stone on the belly of the mother. It would relieve from scorches and would reduce the apparition of blisters. Pink quartz is the stone of love and of the heart.